With Catalog Machine you can import products from your Shopify store in few minutes. After import you can add additional custom fields and images to the product to use in catalogs. At any time products can be updated with recent changes from Shopify. To import products from Shopify follow the steps below. 1. Navigate to Shopify Import page from menu or simply go to https://www.catalogmachine.com/app/shopify. 2. Enter your Shopify store name (the name in front of YourStore.myshopify.com free domain name). Click Preview button. 3. 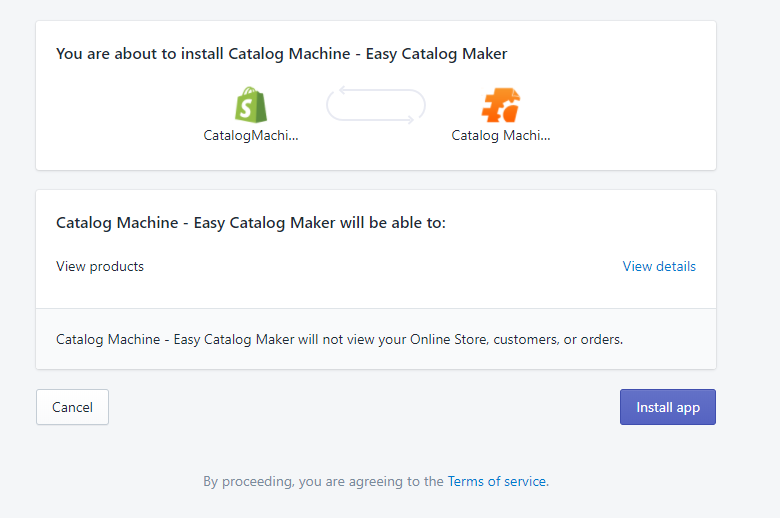 You will be redirected to your Shopify store where you should login and install Catalog Machine app. 4. After install you will be redirected back to Catalog Machine. Click Preview button again. Select products from the list for import. Select a product category that will be assigned for new products on import. Click Import button. 5. You products are imported and can be used now to build catalogs! Product variants will be imported as well including prices, images, barcode and SKU. You can update your products from Shopify at any time from the same page. Additional custom category fields for existing products will be not overridden on update. 6. A large Shopify store with many products require batch processing of import - page by page. Products can be filtered by product collections for import.